How to draw Vasilisa the Beautiful in different techniques? All girls want to be princesses, after all, with these characters they associate themselves. 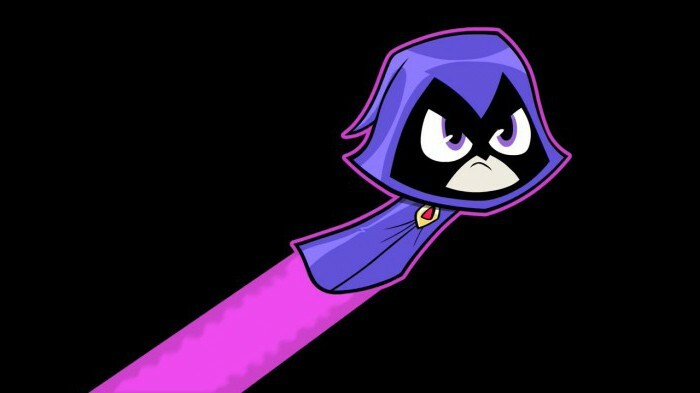 So when the kindergarten teacher said to draw your favorite character, the child does not think. The little girl comes home and asks parents to help her to draw a Princess. Dad hands over the task to my mother's fragile shoulders. How to be in such a situation, it is impossible to fall face in the dirt and tell the child that you are the artist. In this article, we'll show you how to draw Vasilisa the Beautiful. to help the child to grow creatively, first and foremost, we need to support the fuse. So if a girl wants to draw a doll Vasilisa the Beautiful, we need to help her in this endeavor. 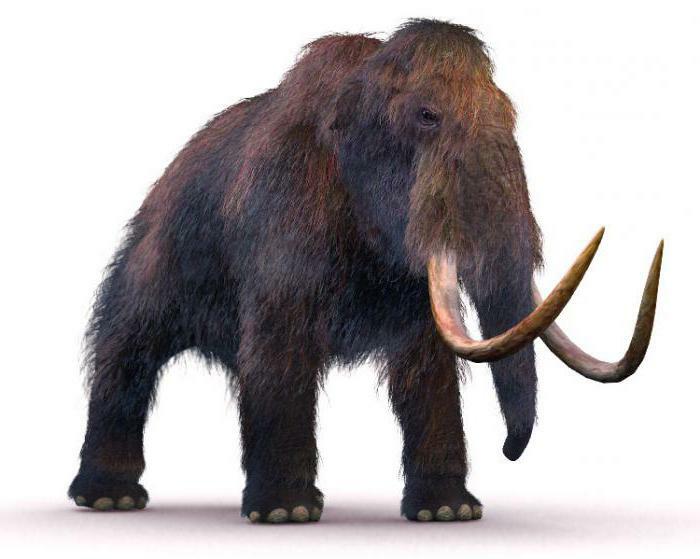 Prepare material, we will need: a sheet of A4 format, hard-soft pencil and soft eraser. Everyone who asked a question about how to draw Vasilisa the Beautiful, you know that the hardest part is getting started. The first thing you should always do before building any of the picture – it's layout. Put two marks, one on top of the sheet, the other below. To get out of them is impossible or else the figure can gradually “to leave” for the allotted boundaries. Now planning a head. Remember that it is within the human body 7-8 times. Outlined circle, it is now possible to detail. 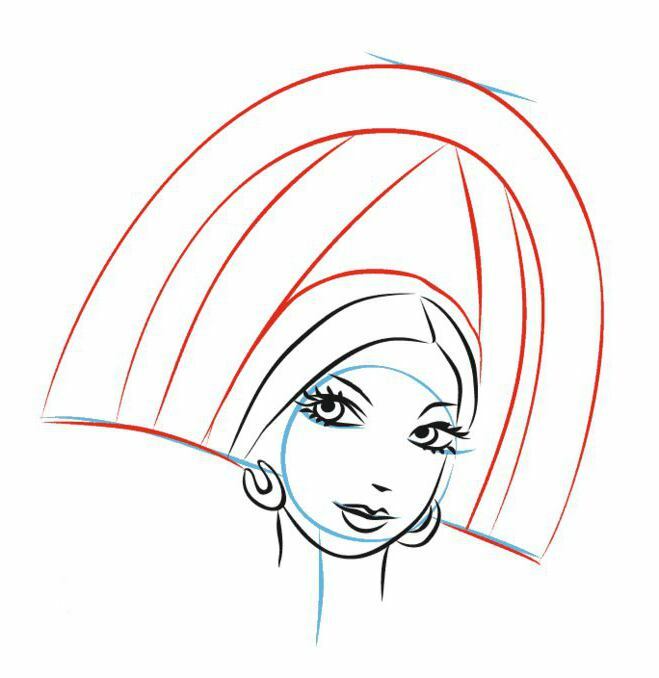 First, we outline the headdress, and only then facial features. Draw eyes, nose and lips. Then go to the build a figure. Our task-to draw the character of the cartoon "Vasilisa the Beautiful", which stands, resting one hand on the side, and the other holding a handkerchief. The figure to redraw completely optional, as it is not visible from under the dress. But to build in proportion to the hands should still be. Remember that the brush comes to a man mid-thigh. Hand Vasilisa needs to be almost on the same line with the other hand. After the build, you need to go into detail. 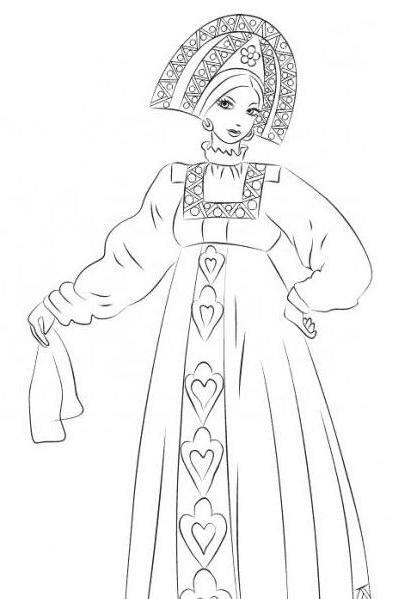 Draw wrinkles on clothes ornament on the dress and headdress. Our beauty is ready. We can paint the picture that we did in the last paragraph or picture Vasilisa the Beautiful in a different position. But in any case, we'll get to the stage when pencil sketch we have the. It remains to add a little color. 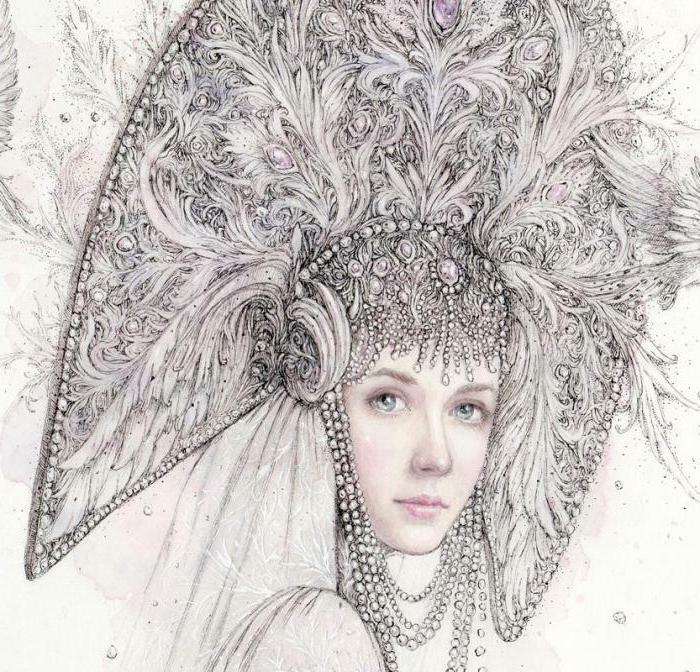 How to draw Vasilisa the Beautiful watercolor? You need to start with drawing shapes. Choose yellow color and prikryvaem them whole sheet. Remember that we have neither pure white nor pure black. When the first layer of paint has dried, begin in turn to apply paint, moving from the lightest shades to the darkest. 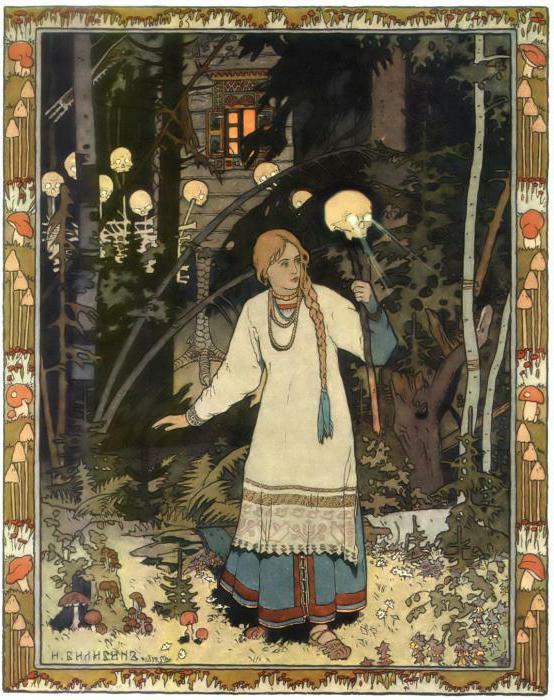 For example, you can look at the illustration by I. Bilibin "Vasilisa the Beautiful”. Artist in this illustration did not use half tones, and we can also afford not to. Just carefully fill with flowers outline, and then outline them with a black gel pen. the Principle of working with watercolor is very different from all other artistic techniques. But not in this case. When a child draws, he's forgiving. The main thing is to interest the child, and to learn the technique it will. 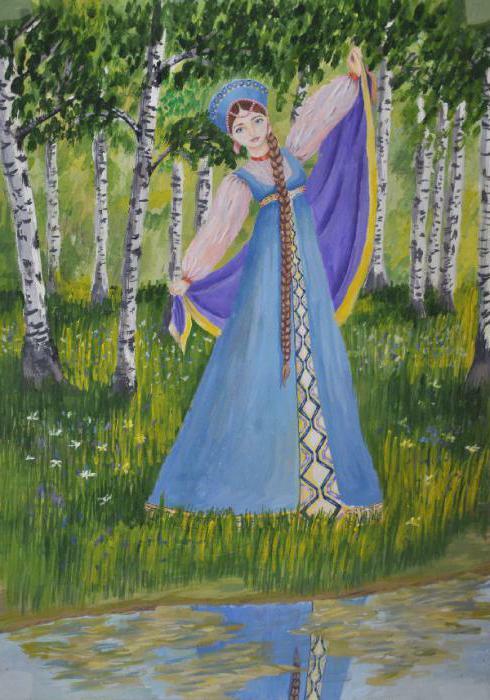 How to draw Vasilisa the Beautiful gouache? First, using techniques from the paragraph above, we attach each part of the picture's own color. And then we can start to draw a shadow. You need to start with apparel Vasilisa. On the dress a darker paint shade referred to, and we denote it on the shirt and the handkerchief. While tracing the figure, go to the back. The leaves on the trees need to paint in a few colors. Final touch – see the reflection in the water. to please your child, sometimes you need to try. How nice it would be to the girl to mom-drawn characters of the fairy tale "Vasilisa the Beautiful". Especially if the picture displays portrait of the main character. To facilitate their work, paint the entire figure as a whole, it's difficult. So we start with the portrait. Half a sheet at once ascribe to the headdress. And then begin to build the face. Draw Vasilisa need in ¾, then not much will be seen proportional to the irregularities. In the foreground draw the eyes, hold the axial and in the depth of the face draw the second eye, less than half of the first. Somewhere in the middle, draw the nose. Not to be trapped, it is better to identify only the lower part of it. And there lips. Painting them, let's not forget the nasolabial folds. It remains to paint the headdress. It's easy. Here you need to show imagination, you can put beads pattern, or arrange them in a chaotic manner.